You are encouraged to raise funds for the Charity or needy cause of YOUR Choice, but please let us know how much you have raised for your cause. To raise funds 'online' we suggest you go to either:- www.justgiving.com or www.virginmoneygiving.com, where you can also obtain Gift Aid to boost your monies collected. Let us have your Sponsor forms/or details of your fundraising,by Prize Giving on Sunday 14th April 2019, so that we have some idea of what has been raised,and who will win the Dyer Trophy for raising the most monies. The forms also go in a DRAW to win Prize Vouchers - so please let us have the information and win yourself a Prize!. You can raise monies for your own special charity or needy cause. You can go 'on line' at either Just Giving or Virginmoneygiving to raise funds. There is a Sponsor Form published which is in Acrobat pdf format and can be downloaded (see below). The Acrobat documents can take 2 or 3 mins. to download. 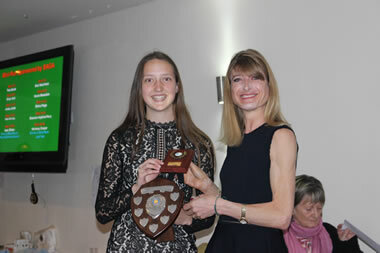 Prize Giving Evening for 2019 is Sunday 14th April, 7.p.m. at AZUR, St.Leonards. At a Packed AZUR Marina, with the biggest attendance ever seen, runners of all ability and their family and friends enjoyed this year's Celebration of The Event. 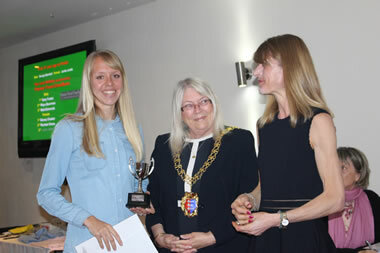 Many new groups witnessed Prizes and Awards given out by this year's Female Winner -Maria Heslop, assisted by our very own Mayor Clr. 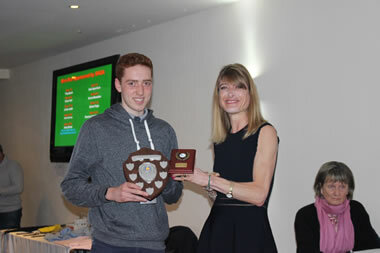 Judy Rogers for the first half, and then the second placed Male Charlie Joslin-Allen for the second half of The Evening. 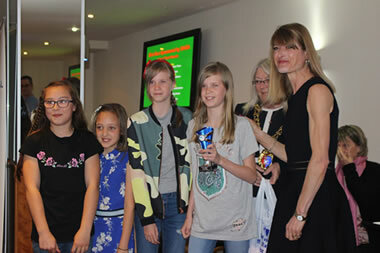 It was good at first to see ALL the youngsters in the Mini Run, receiving their Awards, followed by the school Team Awards. Isaac Elham and Harmony Cooper also collected their Reg Wild Shields. Newly engaged couple Gary Foster and Stacey Clusker (he actually proposed to her as she finished the Race) were the stars of the Local awards. 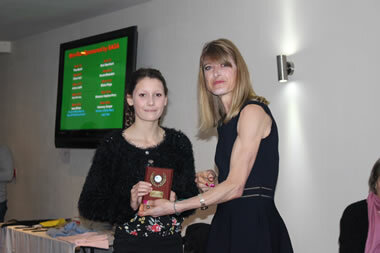 But the Biggest Star of the Night was KELLY BIRD. 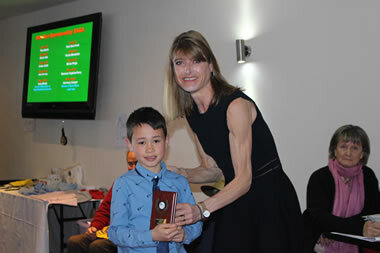 Whilst presenter Andy Knight was giving the citation for The Brenda Boyle Spire Shield of Courage, the whole audience went silent to hear about Kelly's fight against Cancer which started just over a year ago, and her determination to raise funds for Royal Marsden Hospital. Besides running the Half marathon for the first time, she also encouraged another 45 supporters to join her, with raising monies at the same time. They raised over £9500.0. It was very emotional when Kerry came up for Her award, many were in tears, including herself. 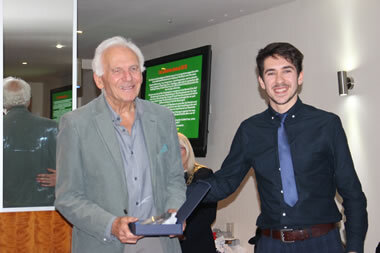 There were special Lifetime Awards for supporting the Half Marathon to Graeme Mouncsey who has been Marshalling for over 30 years, and to Sam Lambourne of the Jog Shop for his support as the event Retailer for 34 years, and he has now retired after this year's Event. Laura Holt picked up the 1066 Cake for finishing in 1066 position. It was good to see new groups/organizations collecting prizes and Awards, like Born Ready Fitness, Heart & Sole Group, Cherry Fit, Judges Bakery and HTH Club. 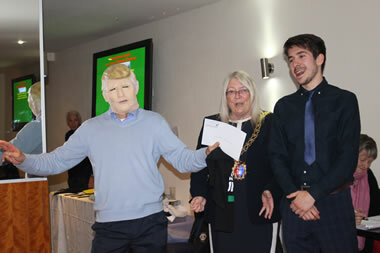 There was even a special appearance by Donald Trump (alias Andy Lee) who won a prize in the Fancy Dress section. 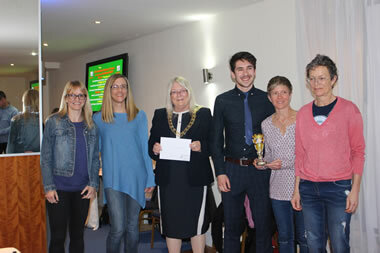 The Charity Teams (6) of Pestalozzi, Team Bird and St Michael's Hospice, also received cheques from The Hastings Lions Club. 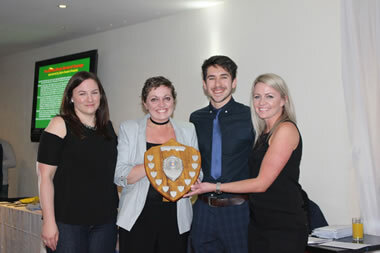 The Winner of the Dyer Charity Shield for the group raising the most for a Charity was Team Bird, who raised £9500 for The Royal Marsden Hospital. 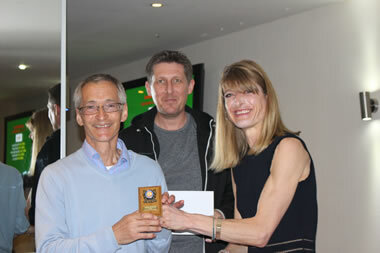 Highwoods Golf Club Team was 2nd with raising nearly £3200 for St Michael's Hospice. 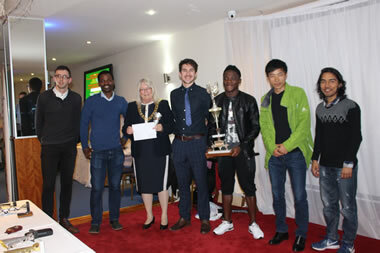 The Hastings Lions Club would like to thank all those who attended, and all the Sponsors who supplied the Prizes and Trophies for The Evening, and to Maria, Charlie and The Mayor for presenting them. And a Big thank you to all our volunteers and Sponsors, as we could not put on this Event for The Town without you. As SAGA has completed their 10 year Sponsorship of the Mini Run, we are looking for a new Sponsor for this Event. Please contact us if you are interested. Souvenirs of The Event are available 'on line' at www.hastings-half.co.uk, where you can also enter for next year's Event on Sunday 29th March 2019. Race Director, Hastings Half Marathon. Organised by The Lions Club of Hastings.